About a year ago, maybe less, when I first heard about a Kato/Lemke ICE4 model release, I made a pre-order for the train with a US importer. I'm pretty sure a price was quoted at the time for both the base set and starter set. I also, think I recall a release date estimate. Well, the train has been delayed. It's not due, according to Lemke, until the end of 2018. My pre-order is still active. However, no price is quoted for the train or the add-on set. I don't like being locked into a sale without knowing the price. Given the moving goalposts, is my pre-order even still valid? Am I likely to have trouble getting out of my pre-order? I don't think I should lose the $10 deposit, but that's not a big deal. I don't mind shopping around and doing some work to find the best source. Also, my German is ok (around B2) so I can communicate with German stores if necessary. Also, I'll be visiting Germany in March, so I could probably set something up then. Is anyone taking pre-orders for this train? With a price? How unusual is it to have an unpriced pre-order? What would be the best place overall (Germany or US) to order/pre-order this item? Also, does anyone have an estimate as to what this train and it's add-on will likely cost. (I won't do something like this again without taking plenty of screen shots). This is the train btw. I think you're better off contacting the store you placed the order with. Only they can tell you whether you will have trouble getting out of your pre-order. Just asking won't hurt. Agree. I will. I'd like to get some "background information", and assess my alternatives first. I'm also, trying to compare this store's prices for other items. If I hear good things about the store, and their prices seem competitive I might stick with the pre-order. I'm not going to pay an unnecessary giant markup, but I REALLY want this train, so I want to be careful. I guess, my second question is - if I hadn't already got a pre-order in - where would be the best source to pre-order the train? Then I can make some comparisons. Does that make sense? I am not interested in this train, but I have just checked some European model train store and no one has price, but you can pre-order it from lot of places. I think you should wait until the approximately price will be released and only at that point you can compare the prices and other costs. Thanks. I think I'll email tonight to get out of the pre-order. Can anyone translate this from Japanese? It's from the 2018 Kato catalog under the heading '2018 releases'. I tried to use google translate but the typeface is too small. I was planning on getting this train from a Lemke dealer. But if Kato is going to release it too, I could probably just get it from one of the usual Japanese suppliers. I wonder if it would cost less from Japan also. It's only a description about the prototype. Unfortunately, it doesn't say anything about the model. Do you have a picture of the whole page? Maybe there's some useful piece of information somewhere else on the page. Isn't kato producing the train for Lemke? At least with american prototypes, I've found buying it from Japan is actually more expensive than getting the model locally. There's not much else. Take a look. Yes, it's "Kato/Lemke". But I don't know anything about how the joint venture works or how it will be sold. So far I've only seen it advertised by Lemke. This is the first time I've seen Kato mention the project. So I don't know if all the models will be sold exclusively by Lemke, or if it'll be a simultaneous release. Either way, I'll be importing the train. Only difference will be Japan vs. Germany. German trains tend to be fairly pricey, but I don't know how much tax (VAT) factors into that, or if I'd be exempt. Nope, it doesn't say anything you're looking for. 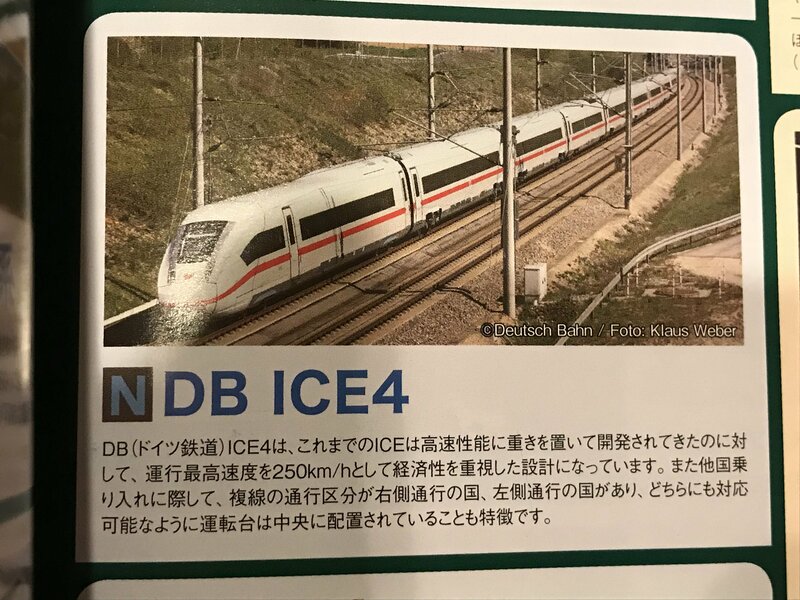 I agree that Kato mentioning the ICE4 in the catalog does seem to imply that they're going to sell it in Japan as well. I would advise to be patient and wait until more information and prices are announced. But, man, those other planned releases! Can you post the scan of that page to the Kato new releases topic as well? This place ships fast and you can "reserve" it and they will send you a link to order when it gets in, so it sounds like you get first dibs if you place a reservation. I'd like for Kato Japan to also sell it as it would guaranteed be cheaper than importing it from Germany. Everything train related from Germany is MUCH more expensive. Especially compared to buying from Amazon.co.jp if they end up carrying in. I have ordered once from this shop and it went smoothly. I got a bunch of D&H decoders and a HobbyTrain H2835 locomotive. They have flat rate shipping to the US (not cheap but not that bad -- 27.50 euro for UPS which took about 4 days to get to me). For non-EU residents they take the VAT off when you actually create an account with them and login and add to your cart. Actually kato japan really put the price up when they sold the Hobby train Plasser and theur ballast tamper in japan later than the euro price of about $120 at the time... Not sure their reasoning. I’m pretty sure the tamper was a Japanese made model made for europe and why I noticed the big increase in price when sold in japan. Are we sure HobbyTrain is made by Kato? Lemke markets their Kato stuff as Kato/Lemke and HobbyTrain is a different brand owned by Lemke and marketed as such. http://www.lemkecollection.deand look under "Hersteller" which is "Manufacturers" as well as at the bottom of the screen where HobbyTrain and Kato/Lemke are listed separately. Looking at the inside of my HobbyTrain H2835 DB BR110 locomotive, it shares nothing in common with any Kato made unit (which are all Japanese) I have seen. You'd think there would be some commonality. If HobbyTrain are not made by Kato, I would guess the high Japanese price is because it is an actual German import, not something made by Kato. Yeah, Hobbytrain is a different company sold through Lemke, the Kato made European stuff that Lemke sells usually uses Kato Branding and Boxing. Further the construction and prpulsion system of the model is not like anything Kato made during that timeframe as far as I klnow, so I think the model was made by Hobbytrain themselves and just imported to Japan later on where it was then ditributed through Kato. That one is actually made for Hobbytrain by Ajin in Korea. I don't think Hobbytrain actually makes models. Edit: Did a little search and it's likely that the tamper is made by Ajin as well. Ahh I had a memory that it was a kato product for lemme/hobbytrain for some reason, but it was a while back. Actually many Hobbytrain models have the Kato text on them, but other contact manufacturers don't put their name on their items, so many people assume that anything that is sold by Hobbytrain is made by Kato. Actually Hobbytrain is just a shop, very much like Conrad or Modellbahn-union. This doesn't stop them from releasing models with their own brandname, but these are always made on contact by different companies. Actually i read it quite a few years ago, that Maerklin has a minimum order of 1000 cars for a custom printed freight car in Z that is otherwise in production. This is why for example the Miniatur Wunder Land could keep a whole range of custom painted cars in stock in their shop. And Hobbytrain probably orders more than 1000, so most manufactuers would make them the model they are willing to pay. This has led to many smaller custom models released in the exact number they have preorders for as this guarantees that there won't be any left and the production will be paid for without any invested money from the seller's side. On the other side, Kato also aims for partnership instead of just work as a subcontractor, so this is why we see Kato products with added Noch branding showing up. 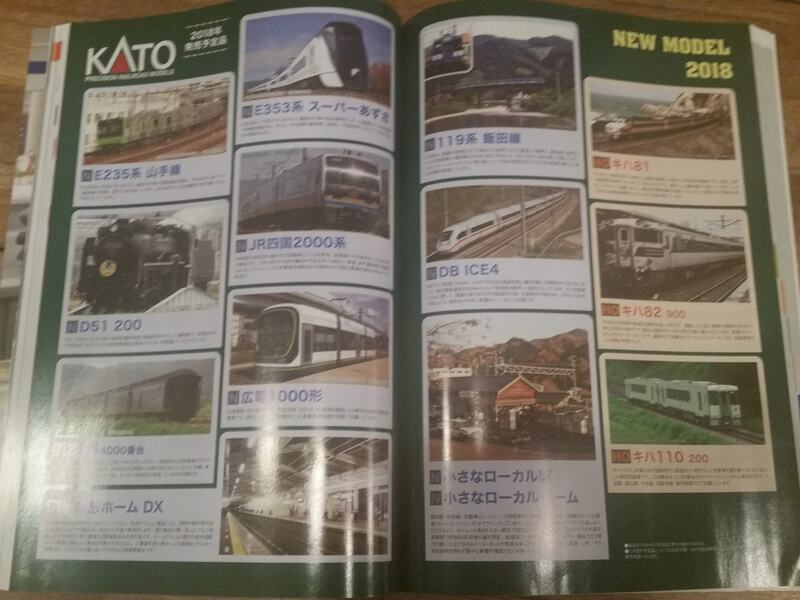 This also explains why they kept their Kato labels for their made for Hobbytrain releases. Does anyone know what is the minimal order from Ajin? Hobbytrain's Kruckenberg Triebwagen was manufactured by Ajin as well. Many people thought it was a Kato model, as Kato prevously made similar German DMUs, like the VT18.16 and the SVT137 Hamburg/Köln. Any idea what that could be? Someone is selling the Lemke ICE4 dummy end car from the trade fair on eBay. Haha! That price. What a joke. It has nothing to do with the upcoming Kato model.